If you are having occasional trouble sleeping, Natrol Melatonin Fast Dissolve is the answer to restoring your natural sleeping patterns. Adequate sleep is essential to overall health and performance, and plays a role in the ability to learn, create memories, solve problems and maintain a healthy mental outlook. By contrast, researchers have found that lack of sleep can result in mood swings and an inability to focus and respond quickly. 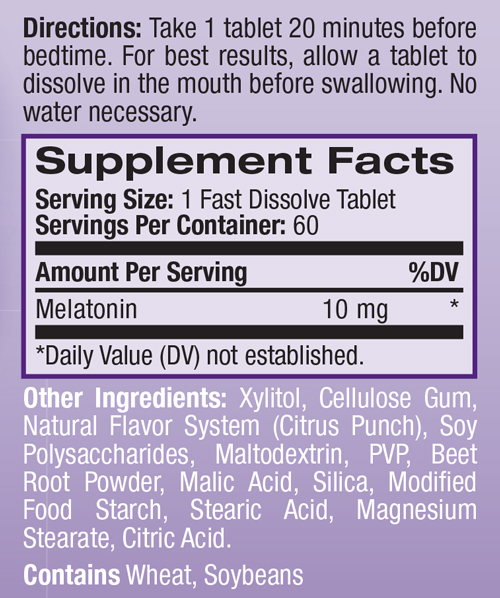 Click the button below to add the Melatonin 10mg Fast-Dissolve 60 Tablets by Natrol to your wish list.